The first time I ever heard about Agape Babies was when I just gave birth to J. I recalled a friend sent me an emailer with some items on sale at the online store. Ever since then, I have counted on them to get my supply of California Baby products. If you follow my blog, you will know that J had a bad bout of eczema when he was about 3 months old. And, after trying different types of cream, only California Baby's Calendura Cream made him better. However, it wasn't easy to find it in brick and mortar shops. Fortunately, there's Agape Babies, who carries the full range of California Baby products. I was quoted in a testimonial published on the Agape Babies website. I also remembered during the times when I was struggling to increase my milk supply, I bought some mother's milk tea from them. I must say this is definitely a one stop shop for all mothers and babies' needs. Recently, I bought some items off Agape Babies again, and was impressed with not only how pretty the site now looks, but also the wide range of brands and products they now carry. They have over 100 brands, and more than 2000 products. More recently, customers are able purchase their babies' daily needs such as diapers (Huggies, Mamy Poko and GOO.n) and formula milk off the online website. That's perhaps what I define as convenience at its best. 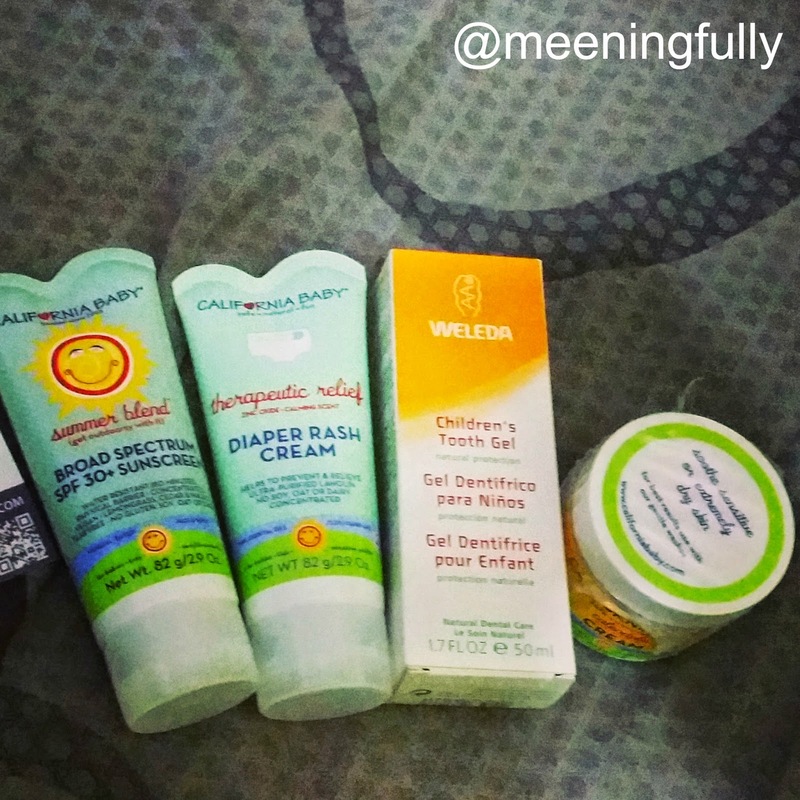 The many brands that Agape Babies carry. With an improved user interface, purchasing online with the store was seamless, and fuss free. Orders above $80.00 is entitled to free delivery, and I managed to receive my items in less than 3 working days. The delivery turnaround time is great especially when, as mothers, most times, we will need some of the items quite quickly. It was a rather pleasant experience with site, and kudos must be given to the people behind Agape Babies for considering the interest of their customers. My loots! Not surprising that it was a great opportunity for me to stock on my products. Since I am happy with the service from Agape Babies, it is only right to share this with all of you. Just for you, my readers, you get to enjoy a 5% discount off all items (except Breast Pumps, diapers and milk powder) from now till 22 July 2014. Remember to quote 5%offmeeningfullyblog on checkout! I know I will be shopping with them again soon! Don't miss out too if you are looking for something for your kid or even yourself! Disclaimer: I was provided with some store credits for purpose of this post. All opinions are my own.